1947 Hollywood Doll, Queen for a Day doll 6"
Photo courtesy of Jody's Attic. The Hollywood Doll Manufacturing Company was founded in Glendale, California in 1941-1956, and supplied more dolls to the market, than any other doll manufacturer during that era. Miniature dolls are 5 to 8" tall, painted bisque, composition, celluloid, hard plastic or vinyl and can be jointed at the neck, hip and shoulder, have sleep eyes, mohair wig glued to head, closed mouths and have elaborate costumes to fit their theme. Some of these dolls are also known as Dress Me type dolls. 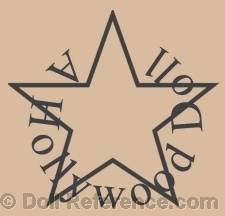 Most of the dolls have the words A Hollywood Doll around a star marking on their back, to identify your specific dolls name, you may have to have it's original clothing, a box or wrist tag. See below for Hollywood doll names or series. Shown above, a Hollywood Doll Company - 1947 Queen for a Day doll, 6" tall, all hard plastic, jointed at the neck, blue painted eyes, blonde wig over molded hair, dressed in a beautiful long white satin and lace gown with full length velvet and faux fur trimmed cape. Doll was made for the TV program "Queen for a Day" that was popular during this era. 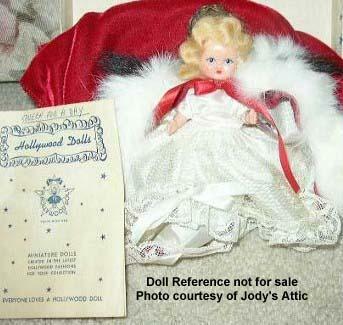 Doll marked on back: with a star, Hollywood Dolls.